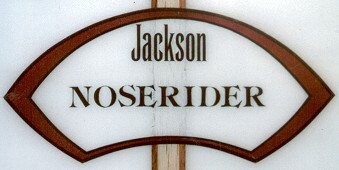 2004 Jackson Noserider 9ft 1 "
57 Captain Cook Drive, Caringbah. NSW Sydney. Foam blank and 3/4'' T-Band stringer (1/2'' Balsa and 1/8'' redwood x 2) by Dion. Natural Necessity Surf Shop, Gerringong. Small black text on sprayed white and burgundy template, Black pinlines, @ sweet spot. 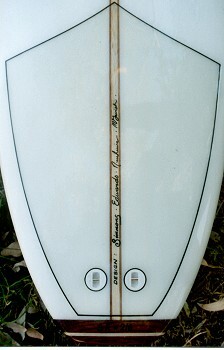 4468 GEOFF 9'1'' x 23'' x 3'' Jim Parkinson 30/6/04 - Pencil on stringer, forward of fins. 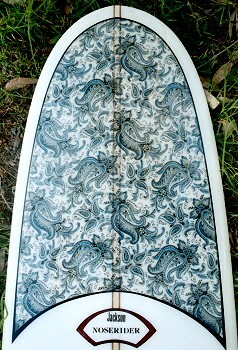 Clear with blue, black and white paisley cloth nose patch, Volan tail patch, Black pinlines. 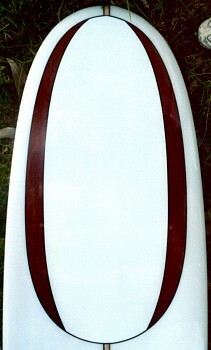 Based on Surftech Nuuhiwa Noserider model dimensions, rocker and bottom. All other features (deck and rails) adapted from McTavish #80 - model supplied. A wide three part, hence ''T'', stringer, usually comprised of a wide soft stringer (balsa, spruce, high density foam) laminated between two thin redwood stringers. One of many decorative stringer arrangemrents common in the 1960's. Often accompanied by a tailblock. Redwood and balsa, 1 1/2''. Supplied and hand made by Geoff Cater. 1. Blue, black and white paisley cloth nose patch. 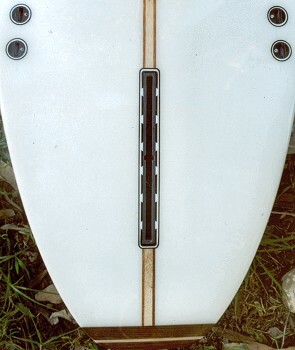 Cloth nose patches were most widely used in the period 1965 to 1968, largely influenced by Tom Morey's Noseriding Contest, 1965, which defined the nose as the front 25% of the board. 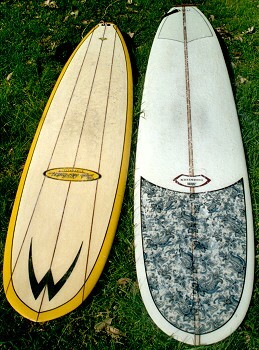 Many modern malibu boards that attempt to reproduce 1960's designs invariably use tropical floral designs (eg hibiscus). These would have been considered passe designs by 1960's designers who favoured the current Op-Art or Psychedelic fabrics - see Blackburn, page 130. Paisley designs appear to be the most popular. By 1969 performance demands regarded decor features such as cloth patches as detrimental due to unnecessary weight. After searching local retailers and several short-end fabricoutlets online, a suitable paisley fabric was eventually sourced from England. (via ebay.com.au) and supplied to the manufacturer. Nose patch length (along stringer) 28 inches - approximately conforms with Tom Morey's competition formula (ie 25%) - see above. Blue, black and white paisley cloth nose patch. An layer of Volan fibreglass independently laminated to reinforce the deck and, as a result of the darker tone, a decor feature. Volan tail patch with pinlines. 1. Faux Decals - image above. The only real paper decal is the small black Jackson. The Noserider "decal" is actually hand coloured using a computer generated template of my original attempt using Geotype 787- 480 ITC 48pt Tiffanny Demi letters hand pressed onto rice paper. An original was successfully laminated as a test, and several copies were supplied to the glasser. Much to the glassers annoyance, the print lifted off the paper of the first copy and these were rejected. The factory substitutes were highly successful. The "decal" shape is a two colour spray directly on to the blank, fibreglassed and pinlined. 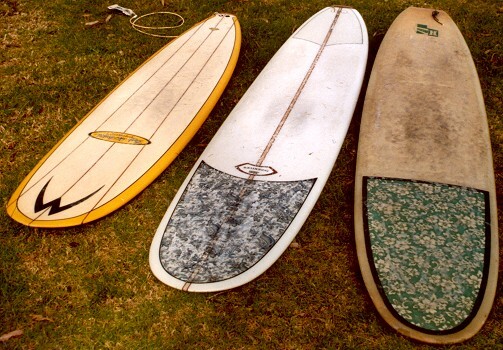 The design is copied from Bing Surfboards' David Nuuhiwa Noserider Model, circa 1966. A two colour spray on to the filler/hot coat, and later pinlined. The nose oval or foil has often been used to enhance a concave nose section. The foiled panels were intended to further accent the concave section and give an asymmetric design when viewed from an offset perspective. This appears to function as intended (I observed the board ridden by a test rider - thanks to John) and is my only original contribution to the design. Hand writen shaper's notes, in pencil. Hand writen notes, in pen. S R # 216 - surfresearch.com.au catalogue number. 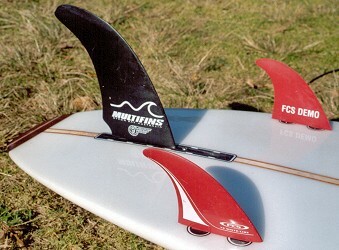 Edwards - first noted application of enhanced nose concave for Morey's Noseriding Contest, 1965. 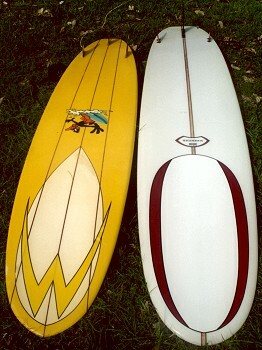 Simmons - first handshaped, fibreglassed multifin surfboard, circa 1948. The board was collected Friday, 30 July 2004. - 1 1/2 inches forward added. 9 1/4'' x 5'' base x 9'' span @ ???? 4 1/4'' x 4 1/2'' base x 6'' span @ ??? Area 250 sq cm. Span 23 cm ??? 1. Secial blank order - 3 weeks. 2. Shaper's hip replacement surgery and recovery - 4 weeks. At one point confusion over the setting of the tailblock was solved with a 1 1/2 hour drive, 5 minute consultation and a 1 1/2 hour drive home. By the time the board was finished, the order details ran to 20 pages.